After 18 months of vacancy, Very Rev. Fr. A. Malayappan Chinnappa SDB, M.A. B.Ed, from K. Pudur, Madurai Archdiocese was appointed Bishop of Vellore. This good news was announced on December 16, 1993. He is the fifth bishop of Vellore and the third Salesian Bishop. The Episcopal Ordination was held on January 25, 1994. Simon Cardinal Lourdusamy was the main consecrator. All the Bishops of Tamilnadu were present. More than 400 priests were present. A good number of Sisters, Religious and lay people were present for the Episcopal Ordination. In 1911, North Arcot District was erected and Vellore was named as its headquarters. In 1989, North Arcot was bifurcated into two Districts Vellore and Thiruvannamalai. From that time onwards, Vellore Diocese comprises of two districts namely Vellore and Thiruvannamalai. These two districts get less rain; Most of the fields are dry lands. There are two rivers and a few tributaries; they are dry throughout the year. There are no factories or industries. Once upon a time, Vellore district was famous for tannery works. Now the tanneries are mechanized and so no work; Matchbox works and Beedi (country cigars) works are done here. In this situation, only education can help these people. 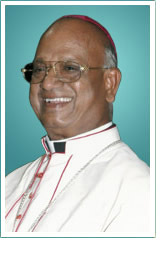 When he was appointed Bishop of Vellore, his main priority was “Education for everybody”. He tried his best to educate all children, raised funds by scholarship and sponsorship etc. and put up good buildings for the schools. He also upgraded several schools that the children may study in the local school. This has helped to reduce the dropouts. To cater to the needs of more people in rural areas, 17 new parishes and two mission stations with resident priests are erected. In 1997, his Sacerdotal Silver Jubilee was celebrated. All that time, the Tamilnadu Bishops’ Council meeting was held in Vellore. As a remembrance, Rs. 2.5 million was collected and the interest is used to help as medical aid to the poor people and widows received proper care. Care of souls is done with Pastoral Plans. Administrative and Cultural buildings are put up. In 2001, He defended a thesis at Madras University – Chair of Christianity and obtained a Ph.D. (on the Pastoral Methods of missionaries especially Paris Foreign Missionaries and the Salesians of Don Bosco). To provide opportunities for higher education, he has invited Sisters of Immaculate Heart of Mary to start University Study Centre, Carmelite Sisters to similar work and the Sisters of Gonzague to start Teachers Training College in different parts of the diocese. Priests, Religious and Laity do receive periodical animation programmes. To cater to the socio-economic developments of the people, one more Social Service Society is established at Thiruvannamalai. Eradication of Casteism is one of its landmarks. The diocesan synod is to be celebrated between September 9 and 13, 2003 with “Building relationships in Dialogue” as the main theme. In July 10, 2002, one of the Diocesan Priests Most Rev. Dr. L. Thomas Aquinas was appointed Bishop of Coimbatore. He is the first one to be raised from Vellore Diocesan clergy to the Bishopric. His Episcopal Ordination was well attended by the Priests, Religious and laity. The new Assumption Cathedral (as said earlier) stands as a historical and an architectural monument. There is a saying that North Arcot District faces famine every third year and flood in the seventh year. For the past four years, we are facing less and less rain. Yet we carry on to do the work of God.